The English translation by Hawkes and Minford (shown above), is called The Story of the Stone. The naturalistic depiction of life in a vast residential compound is embedded in a supernatural tale. In the frame story, a goddess repaired the sky with jade stones, but left one stone unused. That stone was a sentient being who was sent to live in the human world. The stone was born as a boy named Baoyu, the central character in the novel. Thus the story of the stone is Baoyu’s story. The English translation by Yang and Yang is called A Dream of Red Mansions. The title refers to the red-painted buildings in which well-to-do women lived secluded. The novel romanticises the lives of Baoyu’s young female companions, and mourns the end of the carefree era of their lives in which it was possible for them to concern themselves only with poetry, painting and parties. The “dream” could be Baoyu’s memory of childhood and adolescent pleasures, or the author’s, or the stone’s, or all three. What is The Story of the Stone about? Summaries and abridged versions like the illustrated Dream of the Red Chamber, a retelling by Christine Sun, focus on Baoyu’s love for two of his beautiful cousins, the sickly, petulant, erudite orphan Daiyu and the eminently reasonable, practical, agreeable Baochai. In truth, however, there are dozens of characters, thought to represent real people from the author’s privileged boyhood, and the romantic interactions of this core trio form only a tiny part of the narrative. The overarching plot illustrates the sundry problems faced by a large, wealthy clan that has gradually allowed expenses to exceed income, that has failed to uphold the behavioural standards of previous generations, and that has failed to consistently instil good behaviour in the members of its staff. However, the decline of the clan is not at first apparent. The first two volumes of the Penguin translation are called The Golden Days and The Crab-Flower Club. They detail the construction of an enormous garden complex and the activities of a poetry club. Volume three is called The Warning Voice, but the events in it and the following two volumes (The Debt of Tears and The Dreamer Wakes) do not all bring the clan closer to ruin, and in fact their destruction is never quite complete. In part because the novel is composed of many smaller stories and dramas, some of which are directly connected and some of which are only loosely related, there are many lessons one could take from the story, but the overall impression that the stone must have been left with after living life as a human boy is that sometimes life is good, sometimes things go horribly wrong, and sometimes life is merely okay. Why is The Story of the Stone such a celebrated work? The work is treasured for the psychological insight with which the characters are drawn—such a naturalistic style of novel truly was novel at the time—and for the painstaking attention given to the details of their world. You can learn a lot about 18th-century China quite painlessly just by casting your eyes over the words of Cao Xueqin’s story. It reveals historical specifics on a wide variety of subjects, such as architecture and landscaping; clothing and cosmetics; family and domestic relationships; meals and food preparation; birthday celebrations; marriage and funeral ceremonies; religious practice and superstition; educational methods; medical diagnostic practices and prescriptions; types of poetry and literature; terms of employment and servitude; moneylending and financial management practices; and application and misapplication of justice, among others. Is it difficult to read The Story of the Stone in English? Certainly it is difficult to talk about it in English, because every translation makes different choices about whether and how to translate the characters’ names. The Penguin edition names the maids and nuns using English words such as Aroma (rather than Xiren) and Adamantina (rather than Miaoyu). Variations in spelling may further confuse readers of different versions. It may seem strange to translate names, but some Chinese names are words that have literal meanings, or words that sound like words that have literal meanings. The Chinese names of the characters in The Story of the Stone often have some relevant meaning. For example, the novel makes much of the relationship between the “unreal” and the “real”; in fact these are the names of two clans in the story: “Jia” and “Zhen”. Before I read the five-volume Penguin translation, I did a bit of research on the translations of The Story of the Stone that are available in English. I chose the Hawkes and Minford translation mainly because (unlike the Joly translation) it is complete. Although there many, many character names and some specialised vocabulary, the language is quite readable. The poems have been translated so as to rhyme; I can only imagine the effort it must have required. 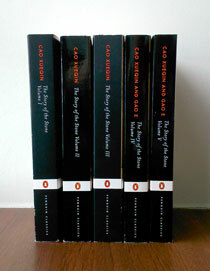 The introductions to the five volumes convey a sense of some of the textual and language challenges the translators faced. The product of their labours, and the authors’, is enjoyable to read as well as worthy of careful study. The Hungry Hundred Book Club will be discussing the book on 28 January 2018.